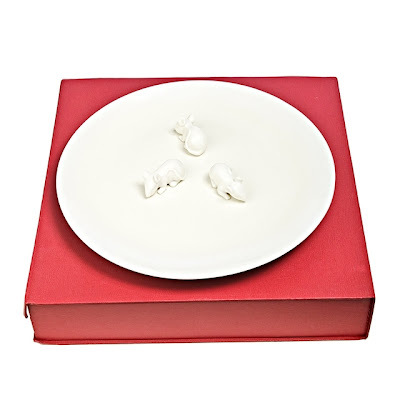 The Designer's Atelier don't really specify that this should be a cheese plate - they just call it a large plate - but with those adorable white mice I don't think it could be anything else. You can't put toast on this plate mice don't care for toast (although I'll concede that the sheer volume of toast you'd need to fill the plate does make that quite appealing). You can even use this to divide your cheese into blue, soft and hard (grapes and crackers and all that gubbins can have a plate of their own). You could even divide into little groups for people who have come for dinner - you don't put cheddar in my section, you put Brie and creamy blues in it. Then everyone has their own little mini cheese course, guarded by a cute mouse. Or, you could load the entire thing with chocolate mice. It's £69 from Bouf so that's pretty much 69 reasons to eat loads more cheese.